Simply, it’s how we see the world. But it’s far more complex than that because our worldview is responsible for our behavior and actions. Knowing your prospective customer is understanding their behavior and actions. It’s being able to empathize with them and see their worldview. That’s the starting point to creating products or services they’ll want to buy from you. Being able to empathize with your prospective customers is literally putting yourself in their shoes to understand their behavior. The best way to do this is to create an empathy map. But this behavioral information lacks context because we need to know the why behind the behavioral patterns. The why is their worldview and that’s why it matters. How does your prospect see the world? Our worldview informs how we behave. Your worldview can be very specific such as, “should I park my car out in the open or undercover” or very general, like having a favorite color. There is no right or wrong because it’s your worldview and that forms the basis for much of your decision making. 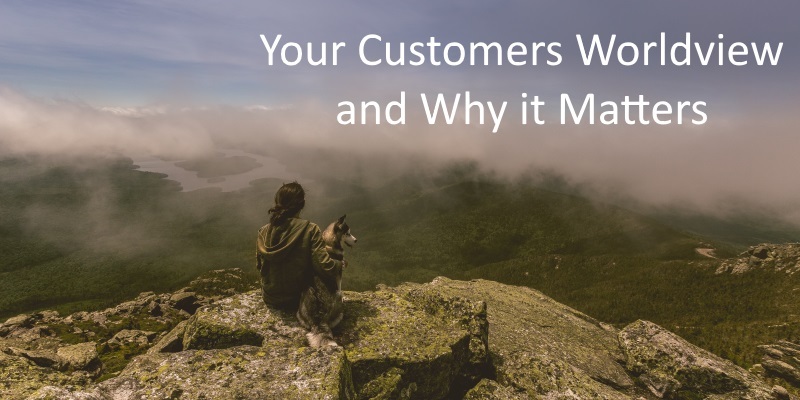 Likewise, your customer’s worldview tells you the reason why they behave, such as their purchasing decisions and the goals and objectives they have. It forms the basis of who they are. You’re not trying to change their worldview. Far from it. You’re trying to understand their beliefs and attitudes of how they see the world, in order to create a product or service they’ll want to buy. Think of your own worldview and how it’s developed and changed over time as different events impact your life. There are obvious reasons for change, such as the influence and opinions of your parents, teachers, and friends. Other reasons are subtle like the type of education you undertake, your work experiences, romance, partners and the kaleidoscope of what is life. Try and recall the simplicity of your worldview at the age of 6 compared with today. With maturity and age, our worldview develops and we see things through different lenses or filters. Our worldview may also completely change about a subject or situation. An example could be your political voting intention when you were younger compared with today. It feels good when someone agrees with your views. That’s when someone has a similar worldview on a topic. They may nod their head in agreement as they read or listen to what you’re saying. They’re attracted to you because you’ve confirmed their worldview. That’s very powerful particularly if it’s a prospective customer. Your message, and what you have to offer, has resonated with them. They’ve actually made a start on the journey towards making a purchase from you. It comes down to doing research, much of which overlaps with the research required to create an empathy map. Let’s take a look at some ways to gather information on your customers worldview. Read comments on blog posts. Sitting down and having coffee with people who represent the type of person you’re wanting to sell too. Monitor social media conversations and online communities that represent your prospective customer. If possible, be a member of the group you’ll sell to. The above list, by no means exhaustive, requires both observation and asking the right kind of questions. The answers obtained will provide a general sense of the way your prospect believes the world works. Keep in mind that your customer’s worldview also changes over time, so your research needs to be of continual monitoring. You can’t be complacent after the initial research phase – it’s ongoing. It all seems like a lot of research and yes, it is. But the aim is to define and redefine who your prospect is. Knowing and understanding your prospective customer is key. It doesn’t matter whether you’re writing a blog post, a book, creating a product or service. You need to know who you will be serving, otherwise, it’s all for naught. I haven’t mentioned markets, niches or personas yet. That will come later. The starting point is being able to emphasize with your prospect and see her worldview. That’s where it starts and that’s actually where the game is won. The work done in this research phase will give you an understanding of who your prospective customer is and why they will do business with you. That’s invaluable.